It's April Fools' Day, the day when you are vulnerable to pranks and jokes at your cost. People wait for April 1 to trick friends, family and colleagues on this day. And as it could be the ultimate test of your humour, we have got some funny quotes and messages that may benefit you. From hilarious quotes to Instagram captions, we have got you covered for the day. 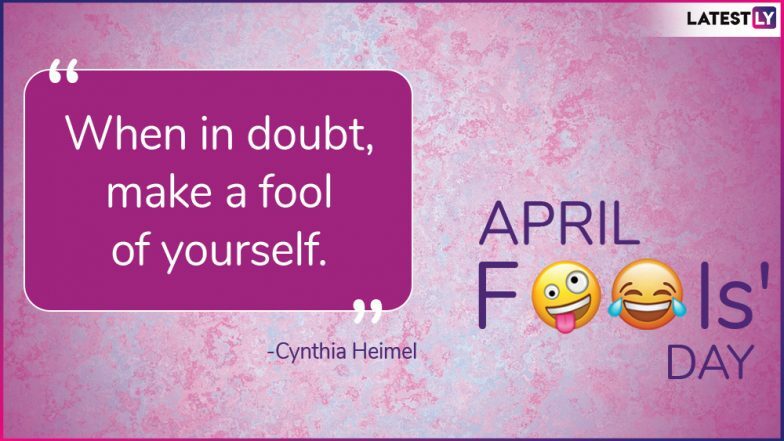 Here is a list of hilarious and wittiest April Fools’ Day 2019 quotes along with some amazing GIF images that will give you all the feels of amusement. Best April Fools' Day 2019 Pranks. Past viral records are proof that not everybody loves this day, especially if they have been the victim of pranks or jokes. But it can actually be a lot of fun, if done right. If you are already driven high about April 1st, these April Fool's Day quotes will double your excitement. Check out these funny April Fools’ Day 2019 quotes once voiced by famous people from across the world. Afraid of Getting Fooled, You can Follow These Tricks to Avoid Pranks. Using any of the above quotes will definitely get you a few likes and a few laughs, especially if you are sharing a prank you pulled on someone in your life. April Fools’ Day comes only once in a year, so enjoy it to the fullest. It fair to say that everybody plays the fool at one time or another, but as long as you can laugh at your silliness, everything is all good. Be a little less mean and enjoy this wittiest day. Happy April Fools’ Day everyone!